Finally we made it to sit on the most famous little stone bridge in St. Andrews ! Not as a spectator but as a player.Without your help we would not have even dreamed of playing at the Old Course. We feel like you are the very reliable big uncle in Scotland. 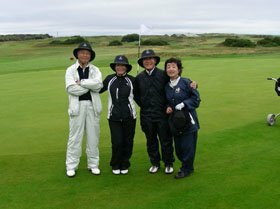 Our friends this time and the last time to have played with us will surely introduce you to their golfer friends.